Lewis Hamilton claimed his fifth drivers' world championship on Sunday to draw level with Juan Manuel Fangio in the Formula 1 record books when he finished fourth behind a victorious Max Verstappen in the Mexican Grand Prix. The 33-year-old Briton's only remaining championship rival Sebastian Vettel of Ferrari, who needed a victory, with Hamilton outside the top seven, to keep his hopes alive, finished second. 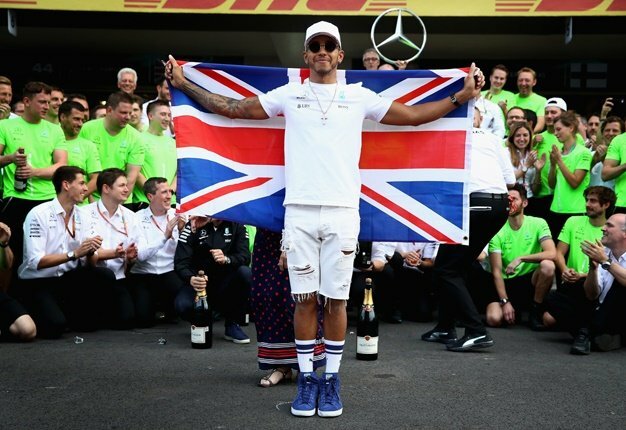 Hamilton's success - the third time he has taken the title without finishing on the race podium - elevated him to a supreme club alongside Fangio with only seven-time champion Michael Schumacher ahead of him. He was adding the 2018 crown to his championship wins in 2008, 2014, 2015 and 2017. He celebrated by executing 'doughnut' wheel spins for the cheering crowd before leaping out of his car and into the arms of his team. After being congratulated by Vettel, Hamilton said: "It's a very strange feeling, a very humbling experience. To complete this when Fangio did it as well, it's a very surreal feeling." "That's how you do it - that's how you drive, Lewis," said Hollywood film star Will Smith on Mercedes team radio after Hamilton took the chequered flag. A puff of smoke signalled an engine failure and his eighth 'Did Not Finish' (DNF) of the season while his 21-year-old Dutch tyro team mate secured a repeat of his 2017 triumph, his second win this season and the fifth of his career. Vettel's Ferrari team mate Kimi Raikkonen came home third ahead of Hamilton and his Mercedes team mate Valtteri Bottas.